The Titans hosted the New York Jets Sunday and came away with a big win, albeit one that came at a big cost. The Titans lost quarterback Jake Locker to a right hip injury midway through the third quarter. Today, the Titans announced that Locker had an MCL sprain in addition to the right hip injury. There isn’t a firm timetable for his return but he will definitively miss the Kansas City game. Backup quarterback Ryan Fitzpatrick stepped in and was rusty at first was settled in. At the time of his injury, Locker was having a fantastic game going 18 of 24 for 149 yards and throwing 3 touchdowns. Locker had yet to turn the ball over and he had a completion percentage of 62.2%. He was having an outstanding 2013 season. Fitzpatrick finished the game 3 of 8 for 108 yards and a touchdown. He did not take any sacks and the Titans still haven’t turned the ball over this year. 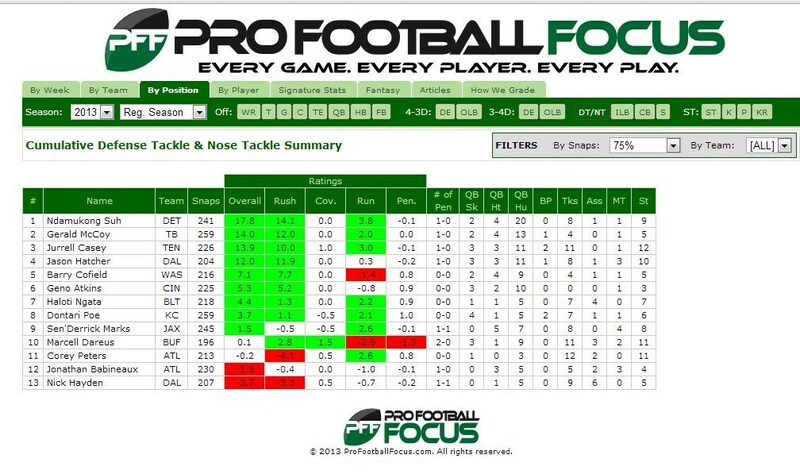 The run game was pretty pedestrian with Chris Johnson completely ineffective. Johnson carried the ball 15 times for 21 yards and a measly 1.4 yards per carry average. Johnson was replaced in the second half by Jackie Battle who rushed 11 times for 42 yards for a 3.8 yards per carry average. 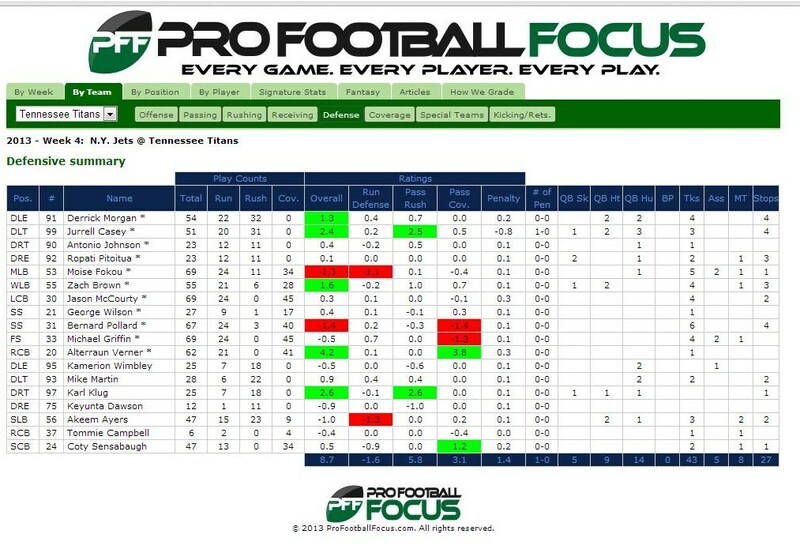 The Jets have a tough run defense but the Titans guards are struggling and center Rob Turner is getting pushed back a lot. Would the Titans turn to rookie Brian Schwenke soon? The guards had a rough day as well but the Jets have the biggest front line in the league. Too soon to panic and you have to expect rookie Chance Warmack will have some growing pains. 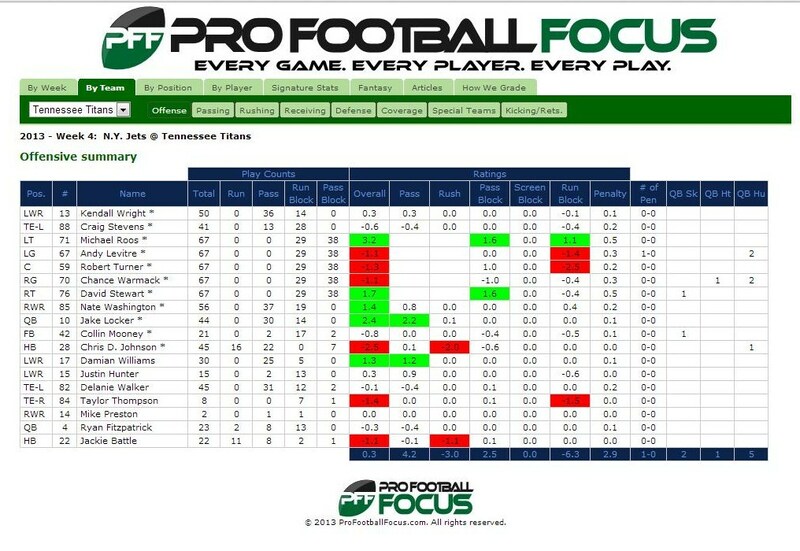 The tackles played very well and graded out very well per Pro Football Focus. Hooohhhhh boy has Nate Washington really come into his own. Through 4 games, Washington has been targeted 30 times and caught 19 passes for 332 yards and 2 touchdowns. It’s great to see Washington having a good year and he should continue to be a big part of the Titans offense. Kendall Wright caught five passes for 56 yards and had 9 targets. Tight end Delanie Walker is the third receiving option right now and finished with 3 catches for 14 yards and a touchdown. Wide receiver Damian Williams got a shot to be a big part of the offense as wide receiver Kenny Britt was inactive with a rib injury. Williams was great catching 5 passes for 53 yards. Rookie Justin Hunter had 1 target and completion and it was a big one for a touchdown to finish off the first half. Hunter has 3 targets, 2 receptions, 50 receiving yards and 2 touchdowns on the season. Darius Reynaud was much better at returning punts this game and almost broke one for a touchdown. He had 2 returns for 36 yards. He did not return a kickoff. Punter Brett Kern was solid as usual punting 7 times with a 41.9 average. Rob Bironas was 100% on the day booting a 26 yard field goal and making all 5 extra points. The Titans defense was simply outstanding and Alterraun Verner led the show with 2 interceptions and a fumble recovery. Karl Klug forced a fumble during a sack of rookie quarterback Geno Smith and scored a touchdown. Titans safety Bernard Pollard was around the ball all day and is one of the better tacklers on the team right now. He led the defense in tackles with 8, six of them solo. The Jets were 4 of 13 on 3rd down conversions and Pollard was a big part of stifling the Jets offense. One stat about Verner that I want to mention is that he was thrown at 4 times and no one caught a pass on him. Amazing to think that not too long ago the critique of Verner was that he wouldn’t be very good in man coverage and was too slow. My how times have changed. It’s nice to see him doing so well as Verner is genuinely a nice guy. Fellow cornerback Jason McCourty is having a solid year as well. I have mentioned before but it deserves mention again how well the Titans safties are playing as a group. Collectively, they gave up a touchdown to the Jets on a 34 yard pass from Smith to tight end Jeff Cumberland but overall the position is vastly improved. Titans safety Michael Griffin is undergoing a rebirth and it’s really nice to see it. He took a lot of flak from fans during his past 2 seasons. On the defensive line, Jurrell Casey is simply a beast and is currently ranked 3rd in the league among defensive and nose tackles playing at least 75% of the time. Casey is a disruptive force in the middle and has 3 sacks on the season. Defensive end Ropati Pitoitua also had a nice game with 2 sacks and a quarterback hurry. He was particularly good in run defense and finished with 3 tackles all of them solo after only playing 22 snaps. The Titans have a solid group of linebackers and Zach Brown is a man. He finished with 6 tackles, all of them solo, 1 sack, 1 quarterback hit and a tackle for a loss. Moise Fokou probably thinks I’m the worst hater since I’ve been critical of his play but he has been better the past 2 games. He only missed 1 tackle. The Titans were a very good tackling team on Sunday. Akeem Ayers lined up at defensive end at least once and got some good pressure on Geno Smith. Second year defensive tackle Mike Martin got some serious playing time (28 snaps) and also had a tackle for a loss and a quarterback hit. Despite the loss of quarterback Jake Locker to injury, the Titans have a lot of good things to take away from this game. It was the most decisive and complete victory of the season and they played well in all 3 phases of the game.